1-Way Residential Streets: Quiet, low-traffic streets with primarily residential buildings along them (Example: Starr Street). These streets are approximately 30 feet wide and could accommodate a bike lane without loss of parking and without impacting the flow of traffic. Many of these streets already have cyclists. A bike lane on a street like this can help organize traffic by creating a dedicated space for cyclists - allowing bikes to travel at their own speed and cars to travel at theirs. 1-Way Mixed Use: Streets that make intra-neighborhood connections with primarily residential buildings and some commercial destinations along them (Example: Irving Ave). These streets are approximately 34 feet wide and could accommodate a bike lane without loss of parking or having to remove any lanes of travel. On a street this wide, parking-lane lines can be striped to define travel lanes, discouraging dangerous driving behaviors like speeding or weaving. 2-Way Mixed Use: Busy streets that make intra and inter-neighborhood connections with considerable commercial and residential buildings along them (Example: Myrtle Ave). Due to the two-way traffic flow and limited street widt, these streets are often too narrow for bike lanes. However, a two-way shared lane is possible. 2-Way Corridors: Busy, wider streets that service higher volumes of automobile traffic and make important connections to surrounding neighborhoods and destinations (Example: Bushwick Ave). Due to high traffic volumes, these streets require further analysis to evaluate and consider what bike infrastructure could be suitable and safe. 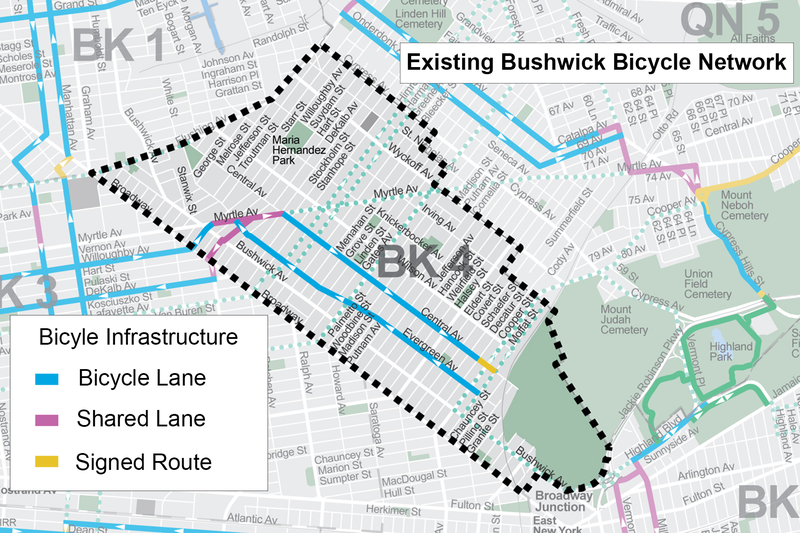 Bushwick’s consistent street grid provides an opportunity to create a strong system of bike infrastructure throughout the neighborhood. NYC DOT is pursuing this bike network in two major phases. The first phase, which will be implemented in 2016, will create a strong backbone by establishing a safer, more equitable system for cycling throughout the neighborhood. The following phase will be implemented in 2017 and will fill-in the first phase, ultimately improving cycling connectivity within the neighborhood and to the surrounding city.